Posted on Sat, Apr 7, 2012 : 5:56 a.m. The idea of individuals buying shares of a farmer’s crop — known as Community Supported Agriculture, or CSAs — is expanding to restaurants. 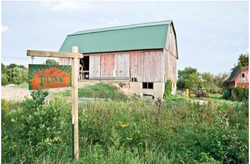 Zingerman’s Deli has signed an agreement with the Tilian Farm Development Center, an incubator for six small farm operations on land off of Pontiac Trail in Ann Arbor Township, to provide produce for the deli this growing season, beginning in late May or early June. It’s the first agreement of its kind between a restaurant and a local farmer, said Rodger Bowser, Zingerman's deli chef and managing partner, although he said he’s tried to convince local growers to offer CSA restaurant shares for more than six years. The agreement was reached in March, and in recent days, Zingerman’s Roadhouse and The Ravens Club have followed suit and signed agreements with Tilian. The agreements call for the restaurants to provide cash up front — which literally becomes seed money — with the promise that Tilian Residency Farm, one of the six small farms under the Tilian Farm Development Center, will provide produce during the growing season. The farm will supply organic greens for Zingerman’s — lettuces, arugula, tatsoi, baby kale, beet greens, spinach and more. Unlike typical CSAs, where shareholders have no say in what they receive each week, the restaurants will have input, and will prioritize a list of what they want. Also, rather than receiving a share of a week’s harvest, the restaurants will subtract the cost of each weekly delivery from the initial investment, similar to using a debit card, said Rachel Beyer, the farm’s program manager. Zingerman’s investment was $2,000, with Ravens Club and the Roadhouse investing several thousand dollars, Beyer said. “The cool thing about the share is that it can be custom-tailored to what the restaurant is looking for,” Beyer said. At the same time, it’s not a guarantee. If one crop’s yield falls short or is destroyed, another will be substituted. They expect to supply the deli with 60 to 80 pounds of greens a week, Beyer said, and will alert the restaurant four days before delivery to accommodate menu planning. At the same time, he said he wanted to support Tilian’s farm start-up concept. “I wanted to support it while also meeting the restaurant’s needs,” he said. Still, it’s not about money. “We want to make sure we can do this again next year. We’re not looking for the lowest dollar,” Bowser said. The Farm Development Center is in negotiations with The Grange, Beyer said. They also have a contract with Zingerman’s Mail Order, where they will supply produce that will be used to make employee meals, and with Darcy’s Cart. Contracting for restaurant shares developed as Tilian Farm began looking for a new CSA niche, Beyer said. There are a growing number of CSAs in Washtenaw County, and Tilian wanted to look for new markets. At the same time, selling restaurant shares is expected to help promote the sale of individual Tilian CSA shares, she said. Tilian will offer 30 individual shares for sale. Tilian Farm Development Center launched last year with three incubator farms. Three more joined this year. Each farm has two acres, while Tilian Farm has five acres. There’s a total of 44 acres. The center serves as an incubator for small farms, and all but the Tilian residency farm have two years to move their farm operations to a more permanent site. All proceeds from the sale of restaurant shares will go back into the TFDC organization, where it will be used to promote the growth of small farms, Beyer said. Sat, Apr 7, 2012 : 6:32 p.m.
Ann Arbor and the surrounding county are a &quot;hotspot&quot; for the &quot;Localvore&quot; movement, but a whole lot more needs to be done to firmly establish a more &quot;sustainable&quot; and a more resileint local food system. Those interested should be seeking out plots in the nearest community garden, or working with their neighbors to establish a community garden process which builds community, reduces our collective carbon footprint, and makes available a wider variety of locally grown produce. See www.growinghope.net for events and programs in eastern Washtenaw County. Sat, Apr 7, 2012 : 5:04 p.m. I'd like to know what makes this unique, aka &quot;the first agreement of its kind between a restaurant and a local farmer.&quot; Sounds ordinary to me. Nice idea, but a traditional one. Sat, Apr 7, 2012 : 7:58 p.m.
A number of local restaurants have been sourcing from local growers for years. Z's Roadhouse uses the chef's own produce (and likely others), and the Grange is well-known for local sourcing, as the restaurant called Eve was. Maybe the key phrase here is &quot;of its kind&quot;. These days most restaurants get their produce from big food service supply companies. Judging by the trucks, Sysco is widely used locally. Some do get their produce from regional wholesalers, but farm direct to restaurant hasn't been &quot;ordinary&quot; for years. The food service companies and wholesalers import produce from out of state, because they get economies of scale and they need a continuous flow of &quot;product&quot; that only other regions can supply. These things often lower the quality of the produce, but restaurants work around that and not all diners care. These local restaurants make high-quality local ingredients a part of their identity, and local diners are willing to pay more for them. Sat, Apr 7, 2012 : 4:48 p.m. Sat, Apr 7, 2012 : 3:03 p.m.
Dang...Spring has sprung! I think I can physically hear the local price of organic greens shooting up by 70% from here. Oh wait, it's just Zing-flation. Sun, Apr 8, 2012 : 2:54 p.m. Nor should they. The Chop House doesn't attract people to Ann Arbor from great distances, and doesn't do anywhere near as much for the community as Zingerman's. It's just another pricey restaurant, little different from any other pricey restaurant. Sun, Apr 8, 2012 : 12:26 p.m.
That is because aa.com doesn't do constant articles about the Chop House, lol. Sun, Apr 8, 2012 : 11:42 a.m.
Wow, two posts from you within one minute, both complaining about Zingerman's prices. They're neither a monopoly nor a charity, and enough people are willing to pay their prices that Zingerman's is highly profitable &mdash; therefore, their prices aren't too high. That's how the market works. If you're not willing to pay Zingerman's prices, simply go somewhere else ... and stop complaining. I'm not willing to pay Chop House prices, but you don't see me constantly carping about it. Sat, Apr 7, 2012 : 2:49 p.m.
A nice website that shows the connections between local farms and local restaurants is http://www.realtimefarms.com/ . You can zoom in on Ann Arbor (where the service was founded) and see all the farms and the restaurants they supply. Sat, Apr 7, 2012 : 1:43 p.m. This is fantastic idea for the farms, the restaurants and consumers. Don't be hating on Zingerman's just because they have ideas that make good sense! Can't wait to get my greens on! Sat, Apr 7, 2012 : 1:28 p.m.
its been to long since aa.com did a story about zingermans . . . Sat, Apr 7, 2012 : 12:52 p.m.
Fabulous. From the farm to the restaurant -- no middle man. Best wishes in this project and truly hope that it continues to grow. Mon, Apr 23, 2012 : 3:06 a.m.
haters gotta hate. buying local produce direct from the growers sounds good for all parties involved, what could possibly be the negative? oh yeah, it's Zingerman's so it must be bad. Sun, Apr 8, 2012 : 11:31 a.m.
No, actually it should save Zingerman's money &mdash; that's the whole point of &quot;no middle man&quot; &amp;mdash and while I don't necessarily expect those savings to be passed on to the customer, it does mean that if Zingerman's prices go up, it likely won't have anything to do with their produce costs. Sat, Apr 7, 2012 : 3:04 p.m. Unfortunately, in this case, no middle man will probably mean sky-high Zing-prices.